Jean and I parked at Road's End (about 5000 feet elevation) and started hiking east toward Mist Falls and Paradise Valley. We started our hike by crossing two footbridges and crossing a few small creeks. The trail continues relatively flat, meandering through a forest next to the Kings River. It reminded me of the Little Yosemite area on the hike to Half Dome. The trail was slightly sandy, with downed trees littering both sides of the trail. Soon the forest changed from a lightly shaded forest to include a few sequoia trees and bright green ferns dotted the area between us and the river. These gave way to what looked like thin green bamboo (I'm sure that's not what it was, but that's what it looked like). We passed a bridge which would allow us to continue along Bubbs Creek, or return via Zumwalt Meadows on the other side of the river. 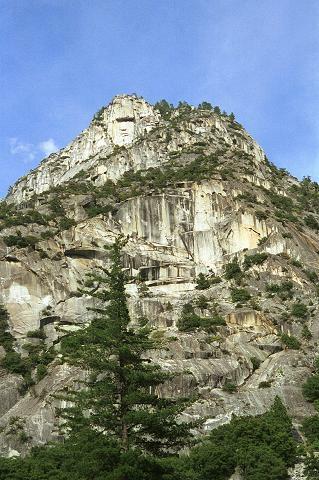 Probably some hikers, not up to the 9 mile round trip to/from Mist Falls, turn around at this point. 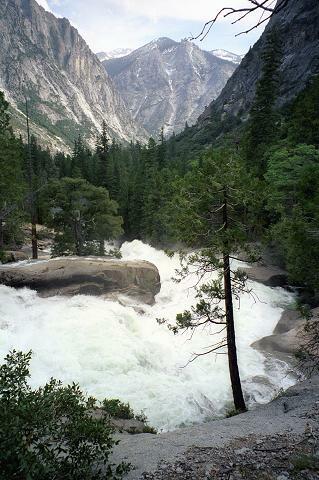 We, however, made the turn north and continued along the Kings River toward the falls. 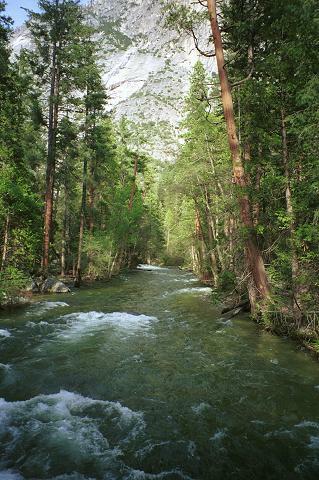 As we continued to walk upstream, the sound of the river rushing by grew increasingly louder. Soon, whitewater was abundant and we stopped atop some granite rock to check out a particularly strong water fall. I stopped to take some pictures. Jean then told me to turn around. I thought she was pointing to the people sitting down there; I thought she wanted to get a better view of the water from there. But no, she wasn't. I looked up and saw something wonderful. Beautifully framed in a U-shaped canyon were snow-capped peaks in the distance, the river running straight through the middle of the canyon. One couldn't have painted a better picture. It was as if someone had imagined the most beautiful Sierra setting they could think of, and painted it onto the landscape. I wondered how long we'd been hiking with that at our backs, never thinking to turn around and enjoy the view. I'm not sure of the names, but we may have been looking at Avalanche Peak (10077), Palmer Mountain (11250), and The Sphinx (9146). I took many pictures before I managed to drag myself away. We didn't know if this was Mist Falls, but it didn't matter, since we were continuing on toward Paradise Valley, so we turned our backs to the mountain and headed up the trail. Soon we encountered an even bigger water fall. Perhaps this was Mist Falls? A large group of people was perched on the rocks next to the falls, eating lunch. We stopped to enjoy the view, then walked a few yards past them and found a nice lunch spot with a view of the river. While we were eating amongst the ants, a little girl walked by on the trail, hanging onto a stick which her father used to help pull her along. When we were about to leave, we saw an ant trying to carry a dead spider nearly 10 times its size. Eventually, after dragging it for a fair distance it appeared to give up. We finally found the real Mist Falls a little further up the trail. And it lived up to its name. The trail had been a nice cushy trail littered with pine needles. And dry. But suddenly the ground turned moist and a few feet later we were getting sprayed by the mist from the falls. And we were still at least 100 yards away from the actual falls. A sign warned us of the falls, and the trail would venture no closer. When I took my camera out to take some pictures, it was soon covered in mist. 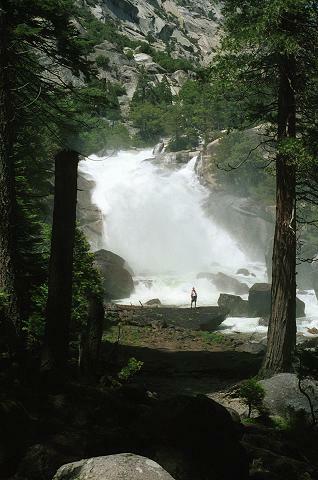 As luck would have it, one hiker decided to walk out toward the falls so his companion could take a picture of the falls and it would have some perspective. I took advantage of this opportunity and took a picture of him myself. We continued up the trail and found yet another, most impressive fall. 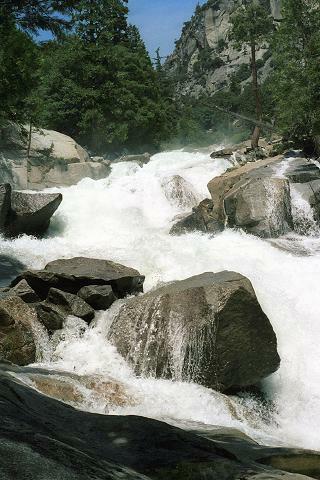 Water was rushing by at about 40 degrees from horizontal, careening down the granite rocks with tremendous power. 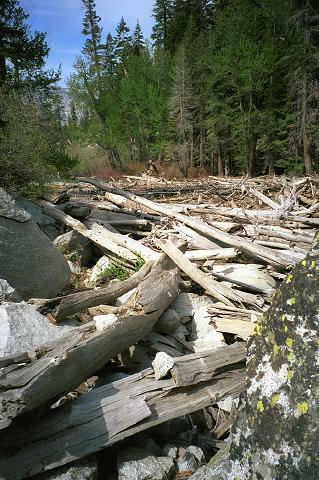 It was spring, and probably near peak runoff. Words and pictures cannot describe the raw power of the fall. The sound of the water had become louder as we hiked further upstream; now, however, it was deafening. I was trying to get Jean to pose for a picture; she was standing 10 feet away from me but couldn't hear me until I started shouting. 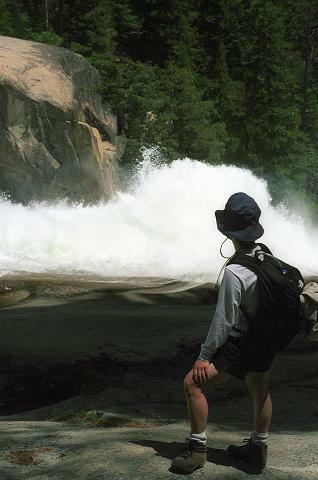 Granted, I have never seen a Yosemite waterfall at peak runoff. However, I think the angle of the rock (not near vertical) and the closeness (we could stand a few feet from the water) makes it a very unique, powerful experience. We continued past the falls. The trail became less and less populated by other day hikers and backpackers. Soon the vegetation changed once again. Instead of the typical Sierra conifers, there were trees more likely to be found alongside the Los Gatos Creek trail back in the Bay Area. The climbing started in earnest. It was a relatively short climb, but most of it is between the falls (elevation 5663 feet) and Paradise Valley (6600 feet). The switchbacks led us up over rocky granite as the trees became sparser. There were still patches of forest, but rockfall must have buried other potential tree growth. Along the way we saw what at first appeared to be small purple flowers fluttering in the area. But actually, they were butterflies! Dozens of them! As we approached the top, we saw hundreds of downed trees stuck at one point in the river. Below that point, water raged downward, the sound of the water hitting the rocks constantly drowning out other noises. Above that point, peace. Somehow the downed trees had become stuck there, perhaps on some rocks. Behind them was Paradise Valley. The river in Paradise Valley is almost completely still. It's more like a lake then a river. It streams gently by, in great contrast to the falls below. We shortly reached a sign marking the beginning of a backpacking area. Backpackers can only camp in designated sites in this area of the park, and all the sites in this area were taken, perhaps 20 people camped in the area. It would make a beautiful backpacking trip; unfortunately, that will have to wait for another trip. 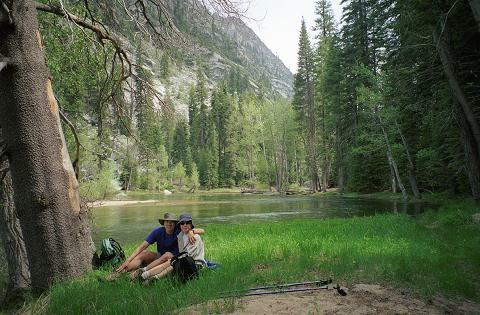 We had to be contented with finding a small spot by the river and taking a well-deserved break. After pictures, a snack, and a break, I filtered some of the water to supplement our supply for the trip back. I stopped at the toilet used by the backpackers. It was really just a big giant hole in the ground with a toilet seat on top; there are no walls; just a tree between you and whoever might sneak up on you. But it had the best view of any toilet I've ever seen. 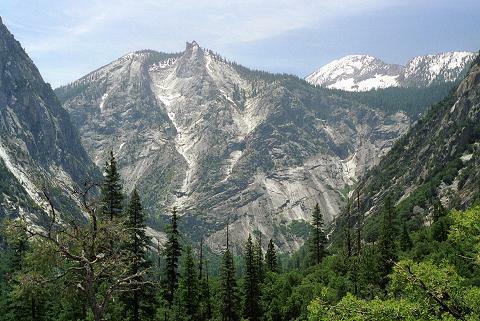 If you were to sit on it, you'd have an unobstructed view of 10,000 foot peaks in the high Sierra. A toilet with a view! On the return descent, I was constantly distracted by the beautiful view of the snow-capped peaks framed by the valley. I somehow managed to avoid spraining my ankle (trekking poles probably helped here) and we continued on past Mist Falls. Along the way we came across just a few people. This included one woman hobbling on a knee brace -- I was impressed she'd made it this far. We also passed a group of people coming in the opposite direction. They were day hikers who seemed ill-prepared for the long hike back -- they weren't even carrying water. 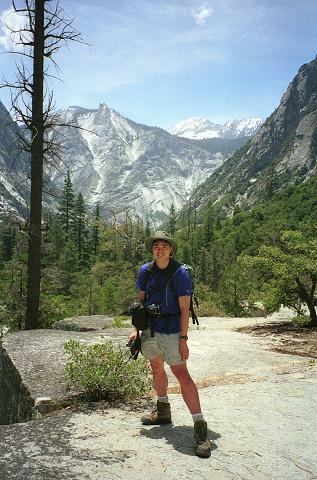 The weather can change quickly in the mountains, and I always take extra clothes when in the Sierras -- even in completely sunny weather. It was getting darker as we continued down toward the river bend. Once we turned the corner, however, the sun brightened our way. Soon we were at the bridge across the river we'd passed earlier that day. A couple and their baby were there, resting; the baby looked like he was ready for a nap, even though the dad had been carrying him all this time. We took a break in the middle of the bridge, watching Bubbs Creek flow into the South Fork of the Kings River. Their combined forces rushed away under our feet toward the setting sun. As we continued the long journey back, I marveled at the amount of work it must have taken to build the trail. In places the granite rocks had to be carved (exploded, one presumes) away. In others, large downed trees had to be cut away. It made me look forward to my own trail-building excursion the following weekend. We arrived at our car over 8 hours after we'd left it. This was an almost perfect hike. The weather was sunny and warm but not hot. Bugs were not a problem. Bikes were not allowed. We saw evidence of horses, but no horses themselves. 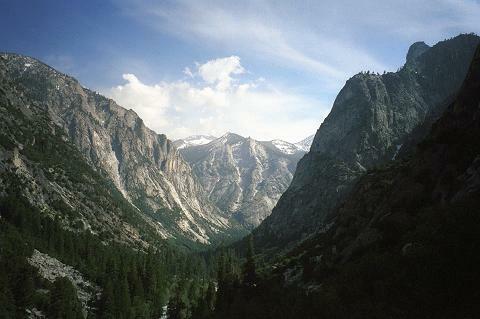 While we didn't reach any lofty summit, we had wonderful views, powerful falls, and a peaceful valley. Nothing beats a hike in the Sierra!